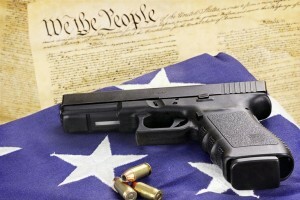 Does Gun Control Reduce Crime? A hot debate in the United States is gun control. Owning a gun has been a right in America ever since the government passed the second amendment. However, crimes and shootings have caused many Americans to believe that we need to create stricter laws to prevent this. Some believe that this will reduce the crime rate, but how does increased gun control laws actually affect the crime rate? Most murders in America usually involve a gun, but how does an increase in gun control affect this? In a study, the statistics show that states with higher gun violence do not have many laws regarding purchasing, owning, or registering a gun. The states with lower crime rates have stricter guidelines for purchasing and registering their guns. There was a study that graded states based on how strong their gun laws were and almost every state that had a high gun crime rate got a very poor grade. This however was considered a correlation due to the inability to find a pattern. Another factor on the gun crime rate was education. Less educated areas seemed to have a higher gun crime rate. In the end, there is always going to be an argument when it comes to gun control and both people for and against have valid arguments about the matter. Increasing gun control laws seem like a logical way to decrease the crime rate, but there hasn’t been enough supportive evidence to prove this claim. This entry was posted in Uncategorized on December 2, 2016 by Ryan Thomas Kusmira. I really like that you chose this topic, especially since it’s a controversial one. I definitely believe we need stricter gun control in order to help reduce the crime right – as of right now, in most states anyone can just walk in and buy a heavy duty piece of weaponry. You had a lot of good points in your blog and you also used a lot of the things we learned in class, which helps understand the blog better. This is a hard idea to have a discussion about this subject, because of how people feel towards it. I have been properly trained on how to use multple types of firearms due to my time in service, however, I also feel that stricter gun control prevents those that would legally be able to own a firearm from being able to do so. Vice did a media piece on the thier Blackmarket series, and they covered the flaws of guns laws and gun control. I think this is a very important topic that America has to deal with. Gun violence is more present today than ever and more people are being killed by guns than fathomable. Not saying the second amendment needs to be taken away but our country definitely needs stricter enforcements of who can purchase guns, how many you can purchase, and where you can carry it. There is nothing wrong with wanting to own a gun for your home to protect your family or for hunting, but sadly guns are being used for much more violent reasons and its uncanny who can just go buy a gun nowadays. The interesting part to note is that 70% of households in this study who do not own a gun are in favor of stricter gun laws, while the group that most wants no change or less strict gun laws are gun owners. I am passionate about this topic and I like to see statistical evidence supporting that stricter gun control laws do go hand in hand with lower crime rates. It is interesting that you brought up education as well, it makes sense that less educated areas have higher gun crime rates. Are the areas with stricter gun control laws also the more educated areas?